And you may come across a lot of “engineer speak” that can be hard for a newbie, or even someone with moderate understanding. 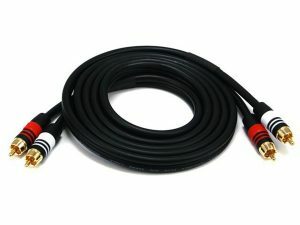 In most any type of recording or production studio, several different types of cables may be used for the purpose of passing audio from one piece of equipment to another. You are probably already familiar with instrument cables, which connect electric guitars and keyboards to amplifiers, signal processing devices, or directly into the mixer. These types of cables are typically of the TS variety, which will be explained in more detail below. 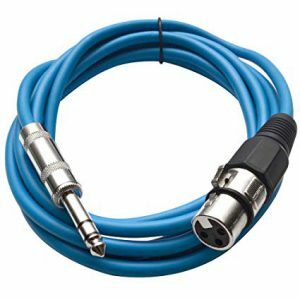 You may also be familiar with cables used to record microphones, which generally use the XLR type connector. For purposes of connecting studio monitors to other equipment, the aforementioned TS cables may be used as well. However, commercial recording facilities generally use TRS and XLR cables to connect studio monitors to mixing consoles or studio amplifiers. 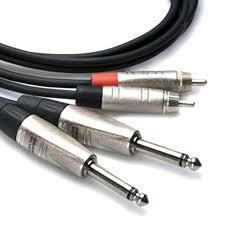 These types of audio cables will be the main focus of this guide. 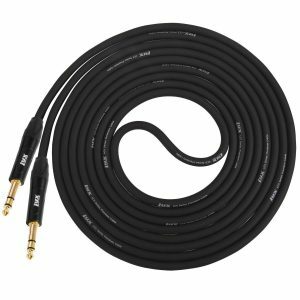 The subject of balanced and unbalanced cables is often the cause of a great deal of confusion, particularly as it pertains to wiring up studio monitors. The main difference between the two is that unbalanced cables carry only the positive audio signal and the ground, while balanced cables carry the negative signal in addition to the positive signal and the ground. Unbalanced cables only have two conductors, which are typically seen as the two contact points on either end. Balanced cables have a third conductor, which can be determined by the three contact points on either cable end as well. With this type of cable, the negative and positive signals are out of phase with each other, resulting in a ‘balanced’ signal. Balanced cable connectors have a number of benefits over unbalanced connectors. They generally have higher signal-to-noise ratios, making them better suited to applications wherein audio quality is a priority. The higher signal-to-noise ratio also makes balanced connectors more suitable for longer cable runs, or connecting equipment over longer distances. Finally, balanced connectors are less prone to electrical interference than unbalanced cables. This helps reduce buzzes, humming, and crackling in the audio path, if not eliminates them entirely. But there are situations where unbalanced connections might be more feasible—if not the only—option. Some mid-range and entry level studio monitors are equipped only with unbalanced input ports, which may be of the quarter-inch or even the RCA variety. With such monitors, the only option is to use unbalanced cables. Even if you have studio monitors that are capable of handling balanced signals, your output device may not have similar capabilities. 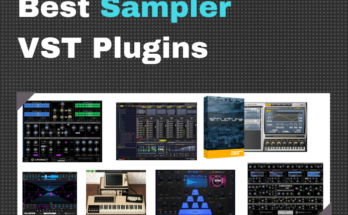 For example, many audio interfaces intended for the hobbyist or home studio market do not have balanced outputs. You then have no choice but to use unbalanced cables. One of the most important things to remember with regard to balanced connections is that every single component in the signal path should be balanced in order for the connection to be truly balanced. This is point that many novice studio owners and engineers will miss. It is especially important to make this distinction when you consider that many balanced ports are designed to accommodate unbalanced signals as well. Many mixing consoles for example have input ports that are able to handle both balanced and unbalanced signals. If even just a single one of these is unbalanced, the entire connection is unbalanced as well. When in doubt, always check the manual or do some research online on your gear to find out what type of connectors your equipment has. For purposes of connecting studio monitors, the connectors you are most likely to see are the quarter-inch plugs similar to those used for plugging in electric guitars into amplifiers and effects processors. But not all quarter-inch plugs are the same, and it is important to know for which specific purpose each type is intended. Quarter-inch plugs basically come in two varieties: TS (or tip-sleeve) and TRS (or tip-ring-sleeve). The easiest way to tell the difference between the two types is to count the number of contact points or distinct metal surfaces on the plug itself. 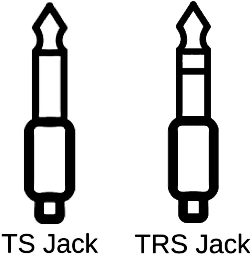 TS connectors only have two contact points, while TRS connectors have three. This allows TRS plugs to carry a balanced signal, as explained in the previous section. The most significant physical difference between the two types is the inclusion of the ring, which carries the negative signal. With TS plugs, the tip carries the positive signal, while the sleeve carries the ground. In a TRS plug, the tip carries the positive signal and the sleeve carries the ground as well. Some studio monitors are equipped with XLR ports as well, which of course accommodate XLR plugs. Like quarter-inch TRS plugs, the three contact points of XLR plugs carry positive and negative signals as well as ground, allowing the handling of balanced signals. Instead of three exposed metal surfaces, TRS plugs have three pins that plug into the three holes of a TRS input port. In studio parlance, you will frequently hear jacks referred to as ‘male,’ and plugs referred to as ‘female’. This practice dates back to a time when political correctness was an unknown concept, and the naming convention has remained a part of studio-speak for better or worse. In any case, you can generally distinguish male connectors from female connectors by the presence of some sort of protrusion. Depending on how you have wired up your studio, your monitors may be connected to a mixing console or an audio interface. Many professional-grade mixers have XLR speaker outputs that pass balanced audio signals to your studio monitors. These generally provide the highest quality audio signal, with minimum noise and electrical interference. You may also have the option to plug your speakers into your mixer via quarter-inch TS or TRS connectors. For live performance monitoring from the control room during recording or tracking, plugging in your monitors via unbalanced TS connections is usually acceptable. For intensive mixdown or mastering tasks however, the lower noise and better audio fidelity of TRS connectors make them the better choice. In many DAW-only studios, there may not even be a mixing console at all. With such a setup, it isn't uncommon to see monitor speakers being fed audio directly from the audio interface. Many pro-level audio interfaces are equipped with quarter-inch TS as well as TRS connectors, while mid-priced and budget-range models generally have a combination of quarter-inch and RCA connectors. Note: Keep in mind that RCA connectors are capable of handling only unbalanced signals. This is frequently subject to contention, with some factions claiming that it can affect the quality of the audio, while others insist that the difference is negligible or non-existent. Among those claiming that cable length affects audio quality adversely, the reasoning is that all cables are subject to the effects of capacitance. The prevailing theory then is that longer cables result in a slight loss of detail in the high end. It has also been suggested that, given two identical studio monitors, the one connected with a longer cable will exhibit ‘looser’ bottom end response. That being said, the difference in response between two monitors connected with cables of different lengths is generally considered to be too insignificant for most listeners to notice. 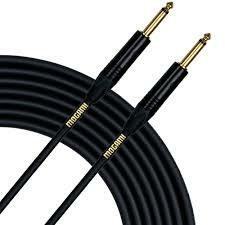 In any case, most people agree that it is best to keep cable lengths for monitor speakers under 25 feet. For connecting near-field monitors, around 10 feet per speaker is the standard length. Many monitor speakers intended for studio applications are equipped with quarter-inch audio input ports (female). Depending on the particular model, these may accommodate TS or TRS plugs. 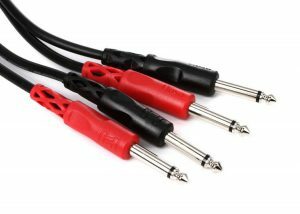 Quarter-inch TS plugs are unbalanced connectors that are typically used for plugging in electric guitars, keyboards, and signal processing equipment to amplifiers or mixing consoles. If your studio monitors have unbalanced inputs, you may use TS plugs to pass the audio signal from your mixing board or audio interface. Studio monitors equipped with quarter-inch balanced ports require TRS plugs. 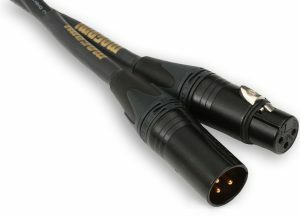 These types of connectors are more typical of higher-priced studio monitors or those intended for the professional market. High-end monitors may be equipped with XLR inputs exclusively, although most will have XLR, as well as quarter-inch TRS inputs. 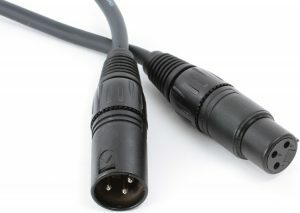 XLR connectors are almost always balanced, and the appropriate cables typically have XLR plugs on one end and a quarter-inch TRS plug on the other. XLR audio inputs on studio monitors are usually intended for +4 dBu/dBm line level signals. 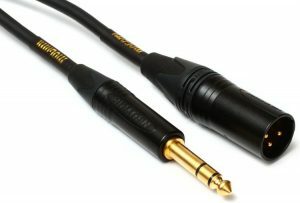 Some mid- and low-priced studio monitors may have RCA connectors instead of the quarter-inch and XLR connectors used in high-priced units. These are typically unbalanced input ports that are designed to handle –10 dbV line levels. 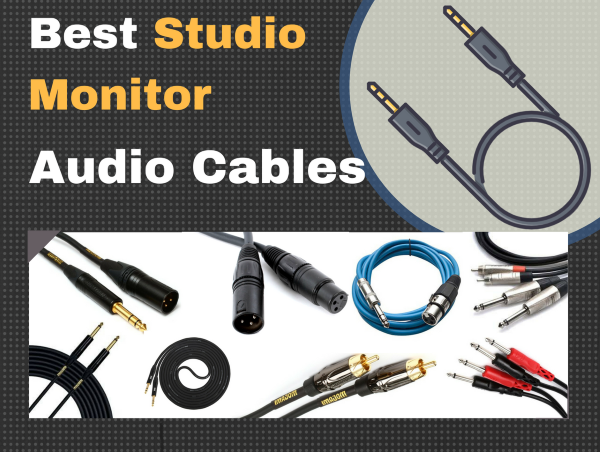 Knowing about the different types of audio cables is essential to getting the most out of your studio equipment. In particular, knowing when and why you should use a specific type of cable to connect your studio monitors to your other equipment is crucial for ensuring clean and accurate audio reproduction, as well as prolonging the life of your equipment. Jump back to studio monitor cable product table. Yamaha: What Cables and Connectors Are Used with PA Systems?